ALSO what was up with back then and them being HYPERlinks! I mean, I know that's still their name but... back then you actually would say HYPERLINKS out loud, and before I knew what they even were they conjured images of space travel and ludicrous speed and they're just... click to go over here. I guess that's why we dropped the hyper in the end. LOL LUDICROUS SPEED! *click the link* "...they've gone to plaid!" and YAY my swirl background --I remember making that in Photoshop Elements 2.0 and thinking "omg I just MADE a background that ACTUALLY LOOKS COOL WHATttttttt"
Animated gifs with neon green backgrounds because the transparency failed. Animated dividers dripping blood. Red text on black background. Comic Sans. Marquees. Blink tags. iframes not targeted correctly. Links to break out of other websites' iframes. No CSS anywhere. it's like a mad version of "My Favorite Things" from The Sound of Music! Sooo this is going to sound crazy, but I actually started doing pixel art before shrine-making. This is one of my first layouts (iframes LOL), on a personal site hosted on freewebs before I got a domain and my own hosting. Yeah, this is about 5000% different from what I do now, hah. When I moved over to making shrine, my style flipped completely. This one is Blizzara's first layout, also iframes (which I still made up until 2007ish). 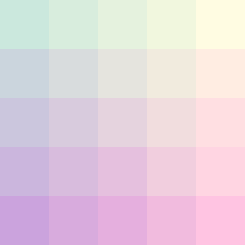 After that, it was just a series of layouts with either divs or iframes in one of three colors They were all pretty pastel-y, in that hyper-blended dream-y style with a shitton of floral images. I also used to change my layout once every 2 or 3 months--how I found the time for it I have no idea. Occasionally, I broke the trend and did something bold and wacky. My latest layout is probably the one on my Sora site, although I'm pretty darn proud of how this one other one turned out, which I think is most reflective of my current style (thanks boostrap :P). I try to shoot for more minimalist layouts nowadays, mostly because they work a little bit better for responsive design, but I still try and give it the detail that I've practiced for a long time. @Fiona Aww, I remember your vexel layout! I couldn't remember if that was Misia or Koda Kumi (Imma go with the latter?). For some reason, I also remember your Rikku layout, though I don't recall if I saw it live or if you had a layout archive...? @Bobbi Gurrrrrl, every time you bring up your Prompto shrine I get super hyped! I should probably make one to Iris or something haha! Man, everyone talking about how elitist and cliquey everyone was just makes me shake my head (tbh I still see the same attitudes in fandom on tumblr and twitter). Getting hosted was also difficult af, though I feel like by the time I bought my own space, prices were starting to drop and become more affordable.